Check me out with another double layout. I'm thrilled my husband took so many photos to our beach visit. We don't go to the beach that much because it's usually windy and cold. As you can tell from the colour of my son's lips, this time was also cold, but they couldn't resist. How cool are these templates? 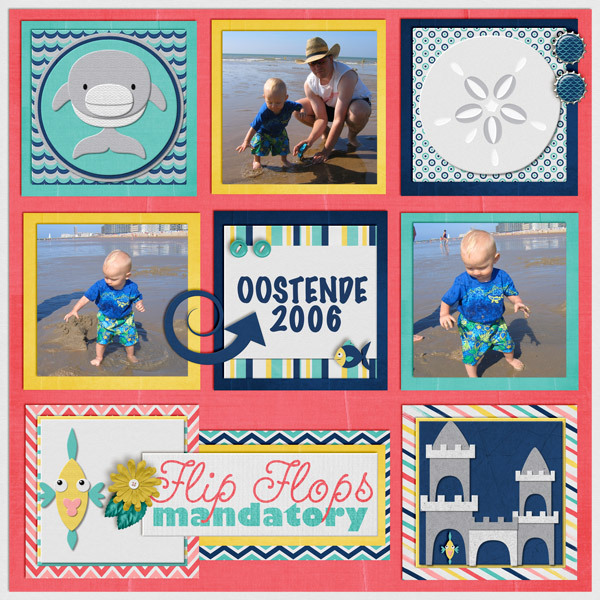 They are from Lissy Kay Designs and they are called Story Grid, Waves templates. Check out the different ways I used them. 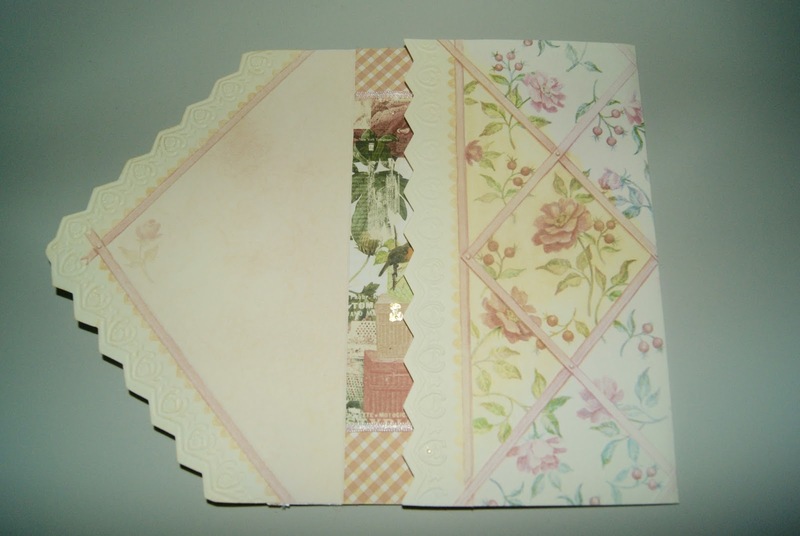 In the first layout, I used a different paper or cropped up journal card in each box. While in the second one I used just one paper, the cloudy paper. My word art was a snap because it's already included in Paty's kit. I just add a couple of extra elements here and there for some more flair. I also add extras to banners at times. Using blue papers for the waves gives an even more liquid effect to the layouts as well as an excellent backdrop to my word art, because the papers are fairly plain, my word art stands out more. 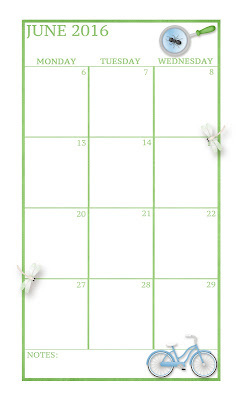 Here, I've designed a template in a bit of Project Life style. These are older pictures from Spain. The pictures will let you know just how much fun the boys had there. There was an enormous puddle after a down pour (I know, right! The crap weather even followed us to Spain! hehehe...) and the kids loved running through it full speed even though it was in the middle of the board walk. The people did NOT get upset. They loved watching these two little blond boys, laughing so hard while playing in the puddle. It was absolutely heart warming to be around people like this. I love creating a scene and I did exactly that in this layout. Check out my hot chickie. I added the flower to her hat and added a tiny lighthouse to give a sense of dimension. Fun, eh? 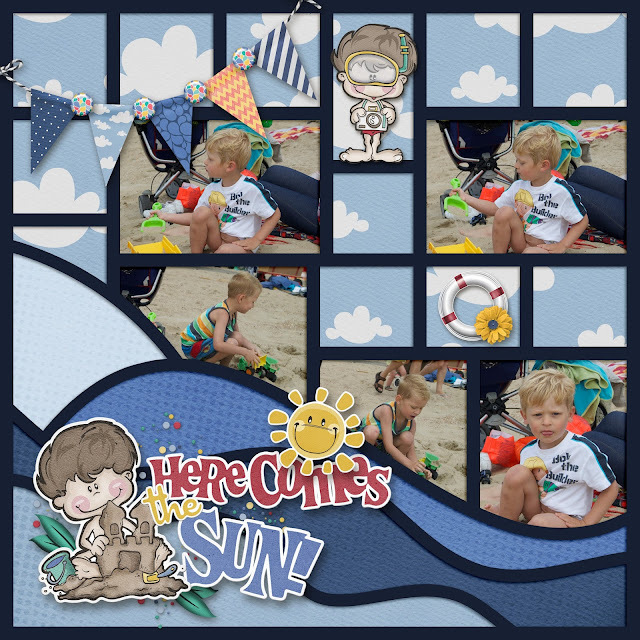 I used the same paper for most of the square and decided to merge the four photo spots in the centre and use just one photo there, but you can use several different ones if you choose. Does that mean? Yes! It means I'm also giving you a free template. Scroll to the bottom to see more free printables and get the link for the template by clicking on the image. And now, for the other part I've been dying to show you. I've designed two different Summer Bucket Lists for you. One is for younger kids and the other is for teens. You may want to mix and mingle if you like, but definitely download both and print so you're equipped with ideas to keep all of the kids busy. Another thing to keep in mind, is that the one for kids could also be considered Autism friendly. 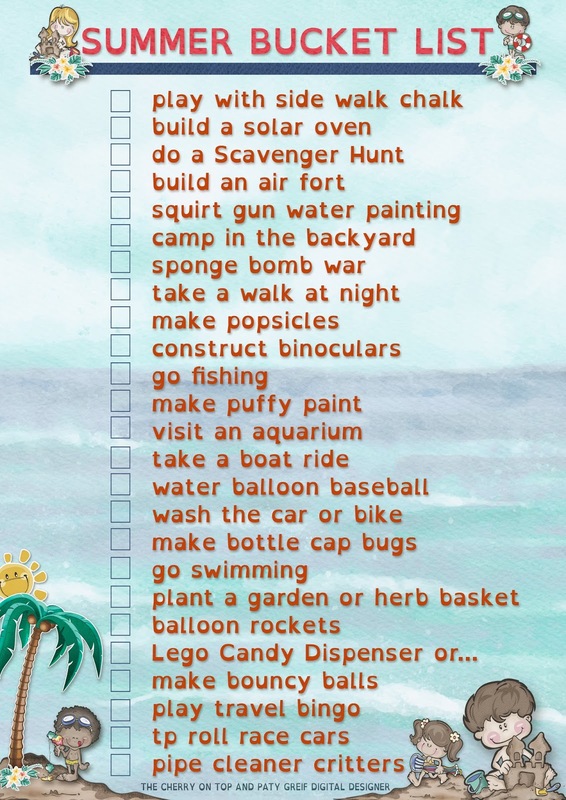 I kept my children's Autism in mind when I created this list. I also used the font Open Dyslexic. It is a font geared towards people with dyslexia. It allows an easier read due to the emphasis on the parts of letters that make them more difficult to read. I use this font any time I print out stuff for my boys. It encourages reading and makes it easier. Click here if you'd like to get the FREE download for Open Dyslexic. To make it even easier on you. Every craft you find on both lists are in our "For The Kids" board on Pinterest. Just go over there and go through our dozens of ideas. If you don't like something here you may find a lot more there, that you do like. You can either right click and download the printable of your choice or you can click here and get both in one link. I've been using a new server for my links and I know some people are having difficulty with Chrome or Firefox. One scrappy sister said she just kept trying and it finally worked. Another changed her browser. Please, let me know if you can't get the download after trying several times and I may consider a new method. All of our goodies are for Personal Use ONLY. Please share around our blog link, give us a like + and or join us in our lovely group on Facebook. Thank you so much for hanging with The Cherries! 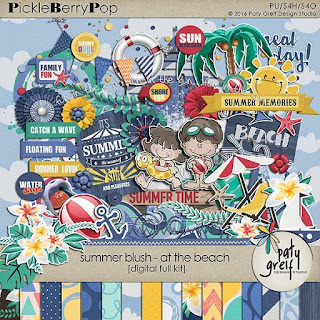 Today, we've got a simple coordinating free template for Paty Greif Digital Designer's newest collection, Summer Blush. 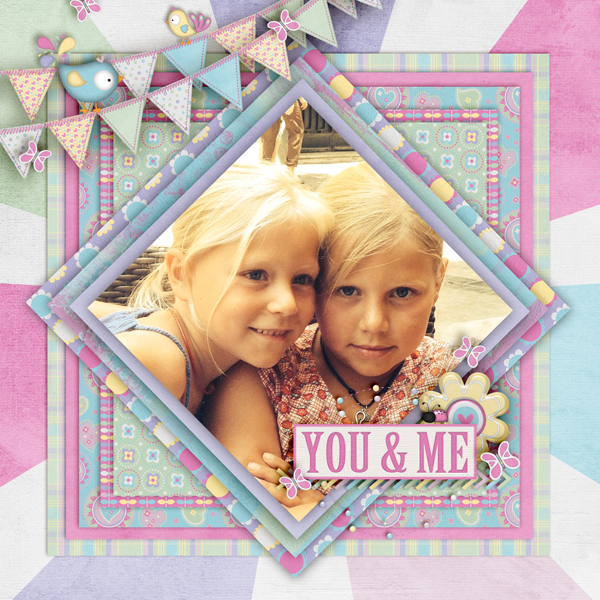 Paty's kits are full of fun, colour and the best doodle cuties ever. I scrapped this collection like crazy. 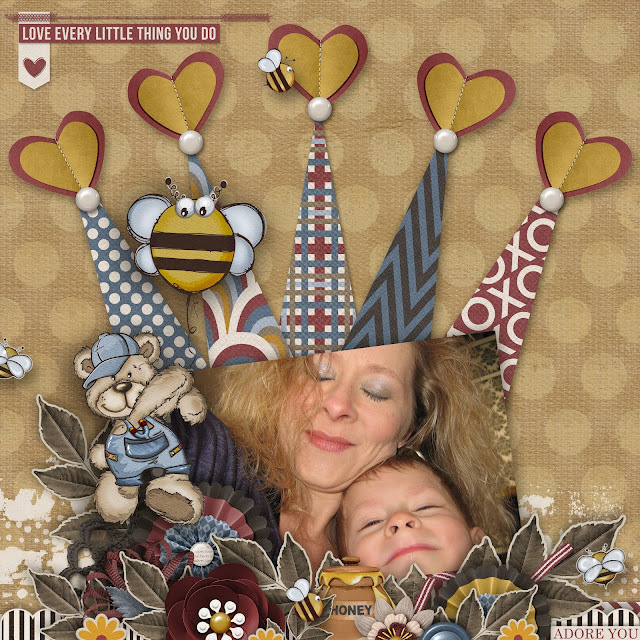 When you come back tomorrow, you'll find a lot more layout love, more templates and some more freebies, too. There is a lot of versatility with digital templates. I merged the four centered squares and clipped in my picture. It's so easy that way! You could choose to use each box the way you like. I often even reshape squares for a customised fit. 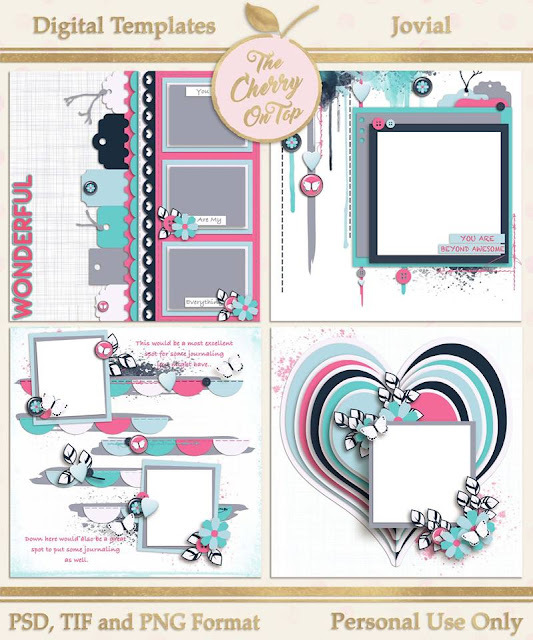 Take a look at some of Paty's new collection, grab it while it's on promotion, download our free template and get scrapping! Just imagine how cool your Project Life will be with these cards?! All of these amazing goodies are awesome for scrapping fast and easy. Collections are THE best way to get a cohesive, finished look in your projects. Here is the template. You could replace my letters with some of Paty's fun, already designed word art. I often just add a couple of elements for the perfect look. You could use journal cards in place of the squares and cluster where you like. I always think of my templates as a basis for your design. Enjoy! Thanks so much checking out The Cherry. 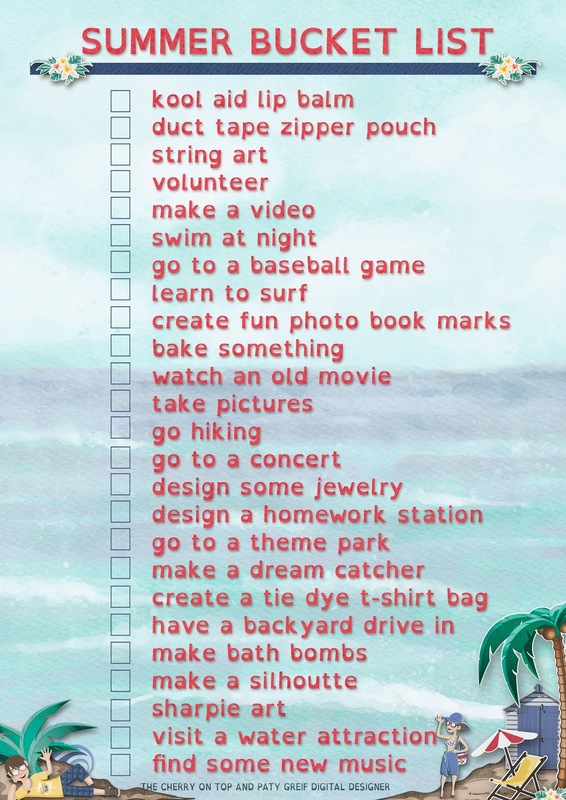 We'll see you right here tomorrow for some summer help in the form of awesome Summer Bucket List printables. We've even got links for all of the crafty ideas to make it even easier for you. You will not want to miss out! Join our group on Facebook and show off what you crafted up this week. Welcome to Throw Back Thursday. Today, I'm bring back the links to four, free templates. They were my very first templates and they are still pretty sweet. Jump over to the blog where they were originally posted to get the link. These are my very first templates. I made the links live again for Throw Back Thursday, but will take the links back down in a few weeks and hopefully, get them in my shop in a couple of months. THESE ARE NO LONGER FREE. They are available for purchase in my Etsy Shop, KreativeMindsDesigns. 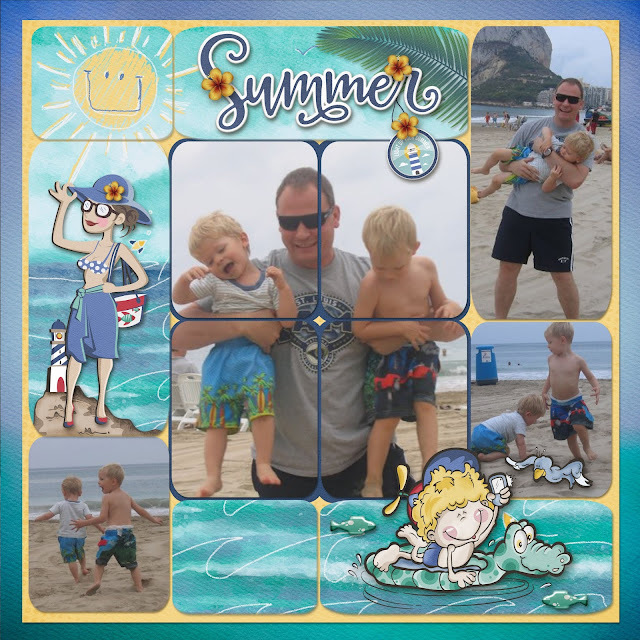 If you download the templates, leave us some love, +, share and Pin as a way to say thanks. All of our freebies are for Personal Use ONLY. They are not to be resold or claimed as your own, thanks. I'd love to see the layouts you design with these templates. Join us in our group on Facebook where you can show them off. 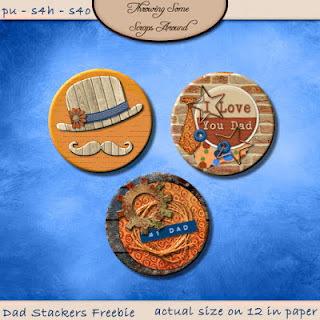 I'll be back with Freebie Friday goodies as well as lovely, free printables for Hybrid Saturday. You really do not want to miss! I scrapped up this card a while ago and forgot to show it off. I wish I would have thought to have taken a before photo. Duh! Hehehe... We'll take a bit of a close look to see how you can recycle nifty cards and use the stash you already have. Scrap up something lovely, fast and save some dosh. My mom still sends cards! Hehehe... I don't know if she knows, but she often gets them back again. 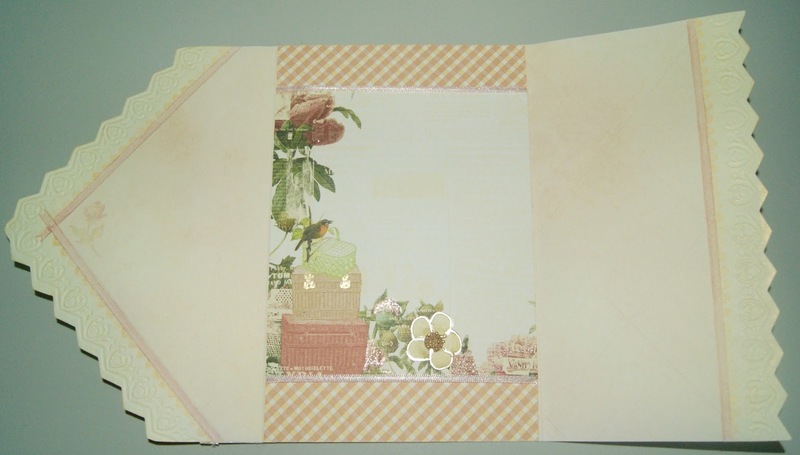 Greeting cards are so super for frugal scrapping. I keep nearly all the cards we receive. You can use the wording in titles, keep the sentiments that are nice and cut and paste them in another. 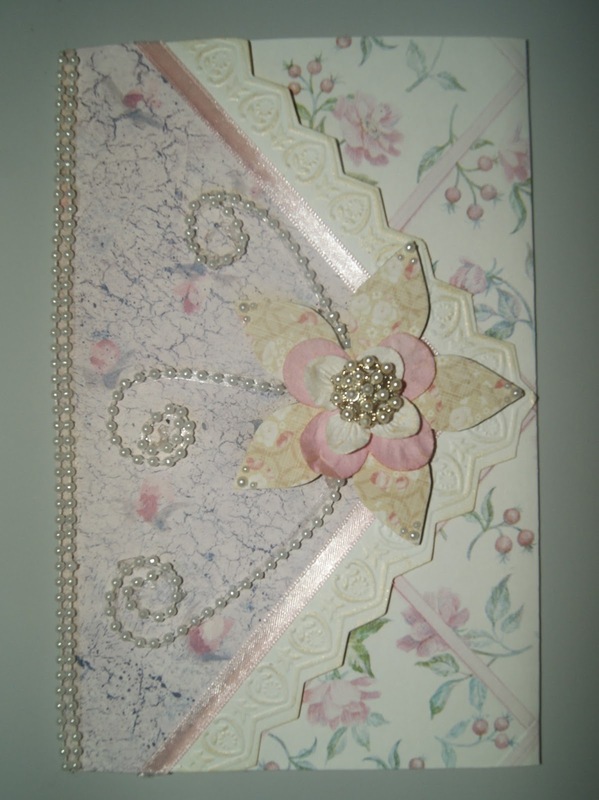 I've made a couple of photo albums out of recycled cards, too. See some here and here. 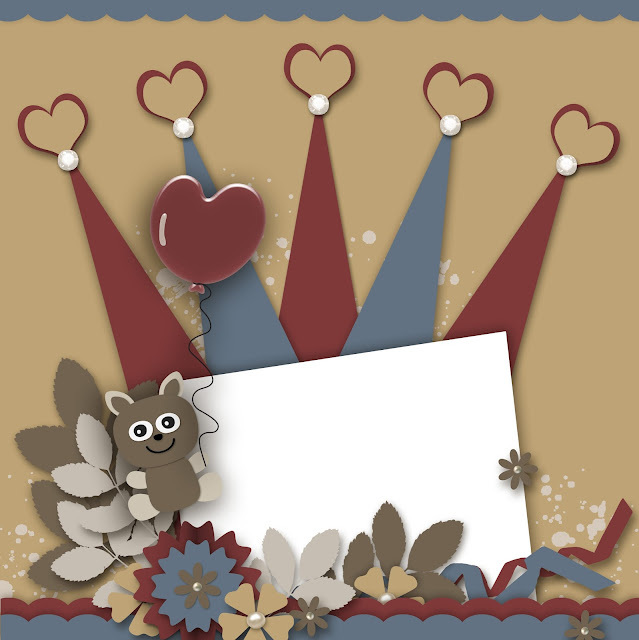 Greeting cards are typically, very rigid, like this one and sometimes they have totally awesome features, also like this one. Loved the edging of this envelope style card and I made it stand out more by inking over the embossing. The pink flower, lattice paper was an original part of the card, but all of the rest is added. 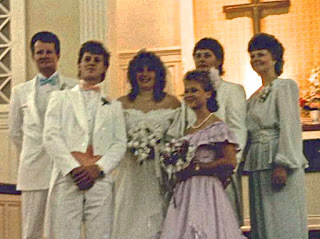 I loved the fine, pink, satin ribbon and the pearls give it a big glamour punch. The large flower is just cut out from a template with like minded colours. The two flowers on top of that give added depth as well as some texture. I love the pearl drops, too. That's a money saver, for sure. The topper is my antique button. These tiny pearls on a string are a staple in my stash. Someone gave me a huge wheel, but they are almost gone. If you know where to find them, hit a sister up! Copy a sentiment from off of the internet if you don't have something yourself. You could print it out and adhere it to your card if you choose. Especially, if you're not thrilled about your handwriting. If you're savvy enough to figure out how to get your printed sentiment on the paper you're using, then that's a thought for you. That's it for a super speedy Traditional Tuesday, up cycled card. 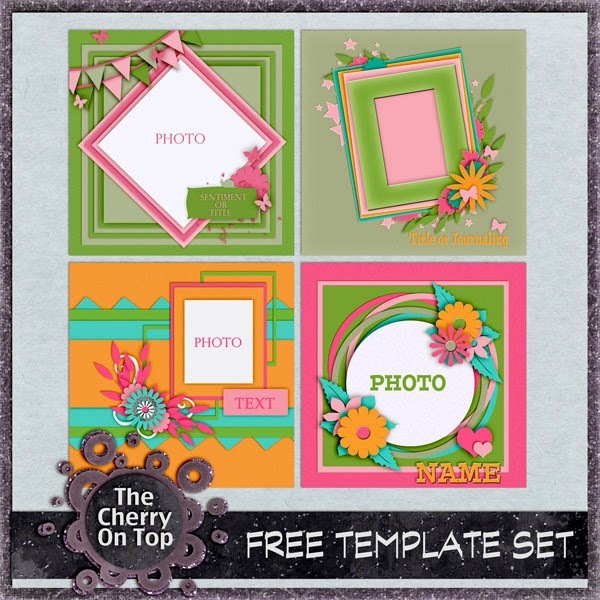 I'll be back for Throw Back Thursday to remind you of a sweet, free kit you may have missed and for Freebie Friday, I'll have more from our Dog Daze Collection for you. 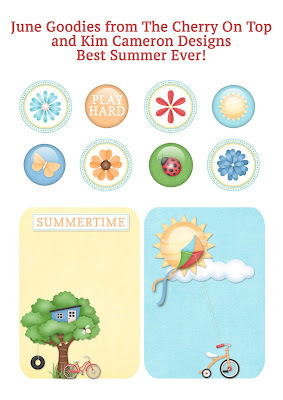 Hybrid Saturday will be free summer bucket list printables from the amazing Paty Greif Digital Designer and yours truly. You won't wanna miss those. What else have you missed? Take a look at some of our most popular posts. This teacher appreciation idea. Just apply a gift card and add a ribbon. It's free! This super summery cluster, also free. And our monthly "Goodies" are always a big hit and they are free, too. Not too, shabby, eh? We love our fans and want to thank you for your continued support of The Cherry. Welcome to Hybrid Saturday with The Cherry. We are knocking out a couple of birds with one blog. 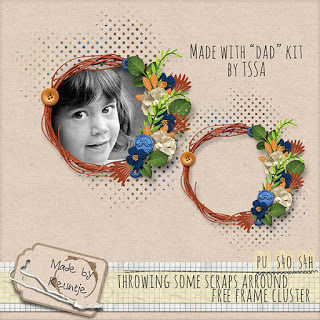 Hehehe...I've got some manly inspiration using Throwing Some Scraps Around's new release, Dad. 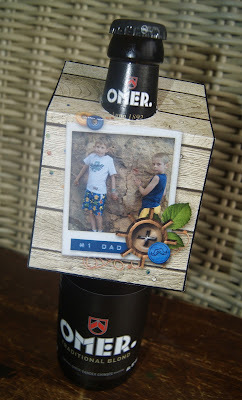 I've also got a boat of load of coordinating freebies including a sweet, Father's Day printable. I used a template from Brenian Designs for this layout. You can find all of her templates here. I scrapped up dear old dad on his last visit to us which was years ago. Boo hoo hoo...Good thing I took so many pictures. 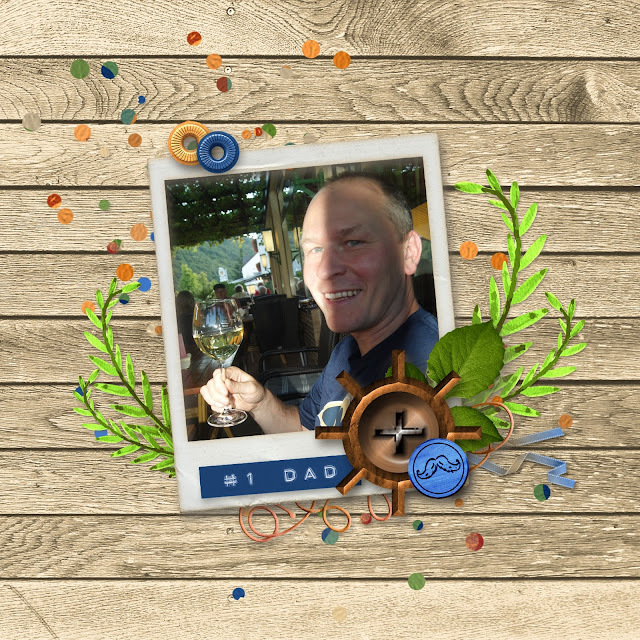 Don't want the kids to forget their pappy. These torn papers are so cool. I love the very realistic effect it gives to digital layouts. I scrapped up my hubby for this one doing what he does best. 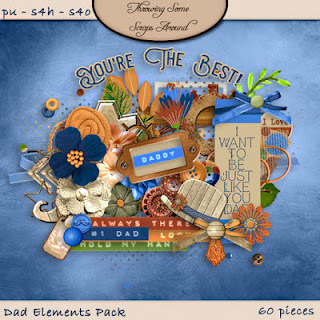 Hehehe...I hope you like this cluster because it's a big part of the freebie. Keep scrolling to see it. This is what the elements look like from Jodi's collection. The colour palette is just perfect for masculine photos. Her quick pages are simply stunning. Add your photos and that's it! This is what we've got for you in the form of this week's freebie. - Download the freebie of your choice or both if you like. 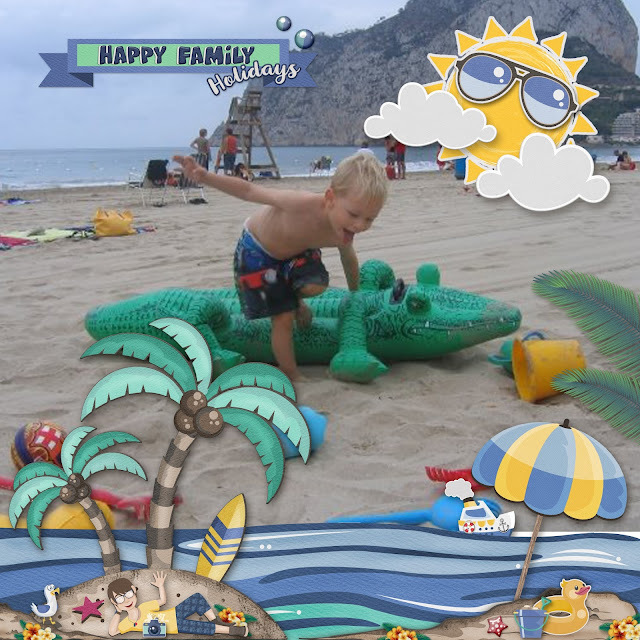 - Open your scrappy program and insert your desired photo. - Print out on rigid paper. - Cut out the hole at the top. 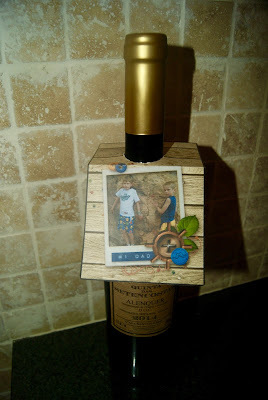 - Hang over dad's favourite bottle of beverage. - Add a bow or other elements if you wish. 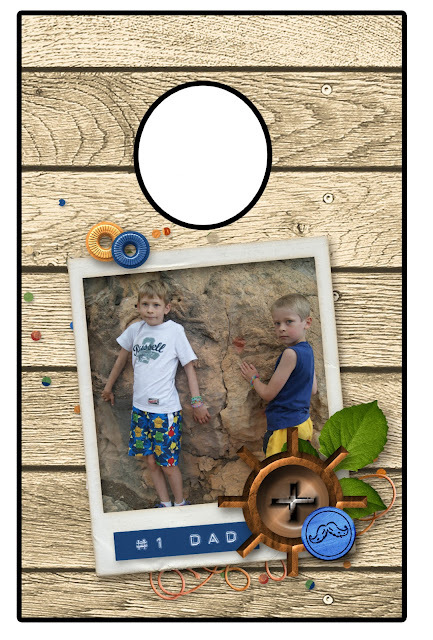 If you don't have a program to pop in a photo you can use our generic version with a simple sentiment or you could use an exacto knife to cut out the frame and circle and glue a photo to the back of the tag. Simply right click and download for your bottle tag. It is in png format so the background won't show up. With this version, you could use this tag for any occasion and if you're really savvy, which I know you are, you could paste other embellishments over the moustache and #1 Dad sticker. 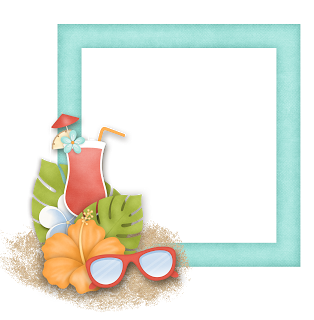 There are so many other fun freebies you can snag. 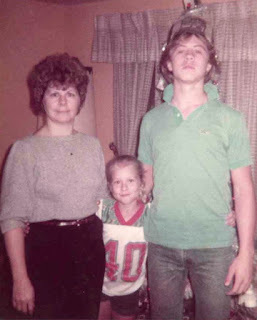 Click on these images to get to Jodi's blog for the links. A gorgeous cluster from Made By Keuntje. 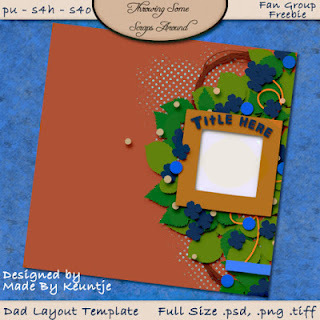 This totally awesome template also from Made By Keuntje. Keep in mind that our freebies are for Personal Use ONLY. They are not to be claimed as yours or resold. 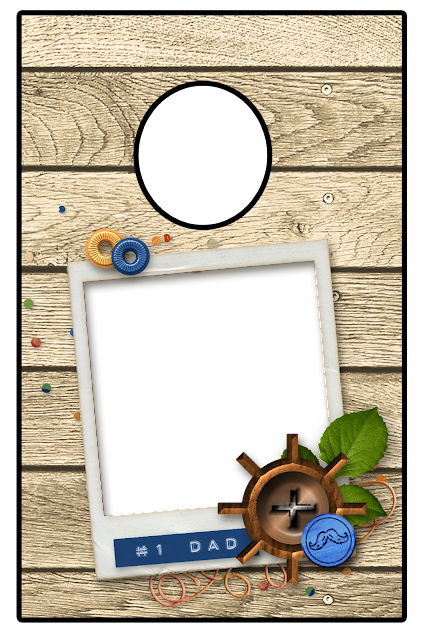 If you haven't chimed in this week, you've missed a step by step traditional scrap, a free template and this word art for Throw Back Thursday and another free, digital template or quick page from Freebie Friday. Thank you from the bottom of my heart for stopping by The Cherry! I Love You Beary Much, but you know that already, right? Hehehe...That's Paty Greif, Digital Designer's collection. 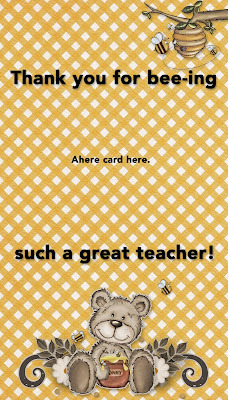 Last week, I made a free teacher appreciation printable with it. Scroll further to get that link so you can download. 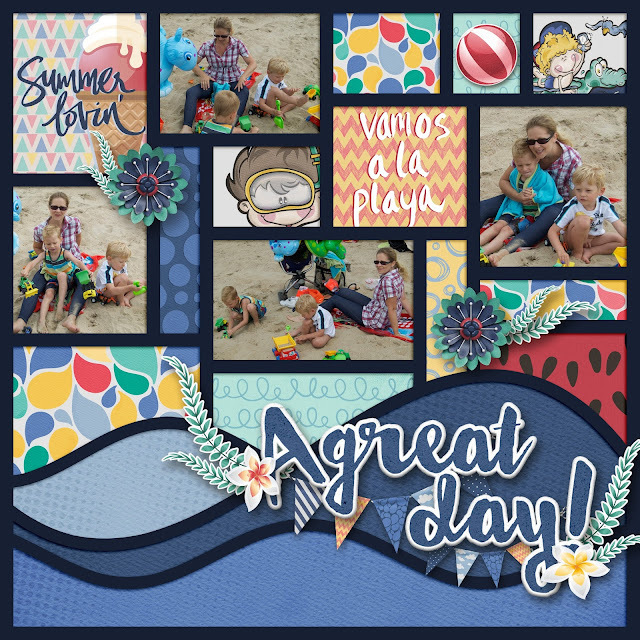 Today, I'm showing off a free template using inspiration from this layout. Find out how to get it and see what's in store for tomorrow. 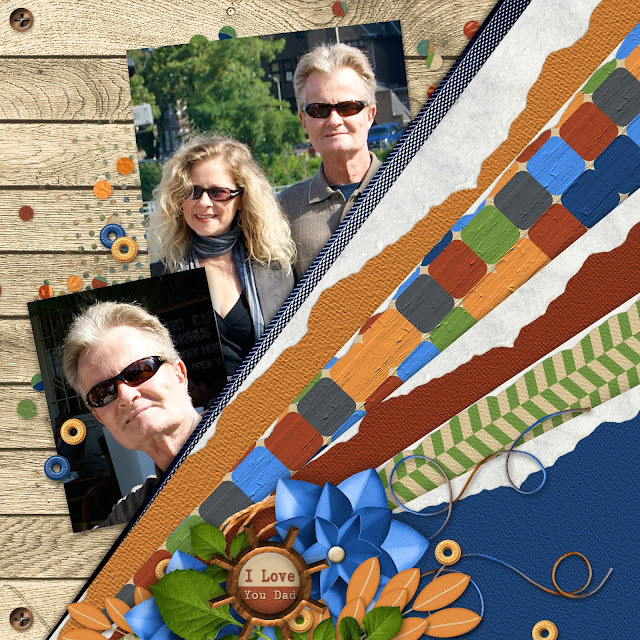 I've been in a group, Scrapbook Layouts, on Facebook for a few months now. I love it there so much, I wanted to started a group similar to it, but offer games, fun, tips, tutorials, share links and give out more free, exclusive goodies for those who participate in the group. I've found most groups are just page dump offs. Creative Team members post their layouts and leave again, like a sad one night stand. Hehehe... I really don't like those kinds of groups. You don't even know who is looking at your pages and there is not a lot of communication going on there. I want The Cherry On Top group to be more of a community. 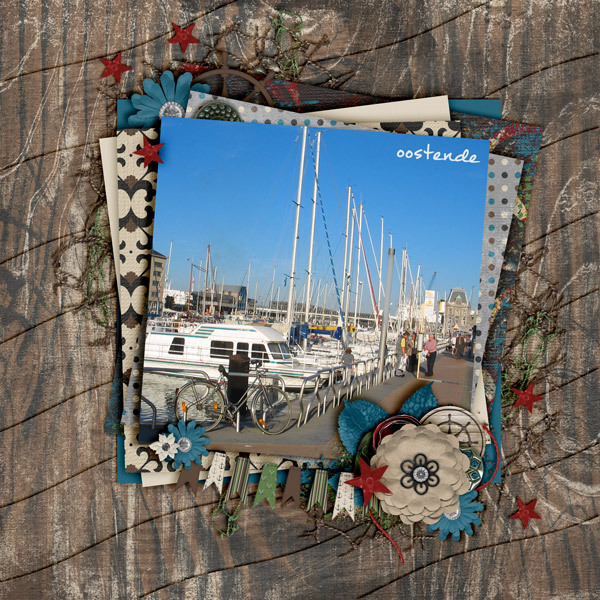 A place to laugh, share and oggle lovely crafty, creative projects. 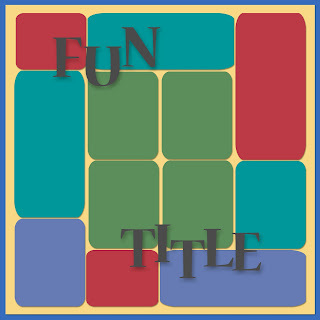 We've already played a couple of games and I offer challenges and prompts to get your creativity flowing and encourage others to share their work. This template could even be used as a quick page! Become a member of the group and I'll send you, via message, a link for this free template. If you're not on FB, leave a comment on this blog and if I get more than three comments, I'll post the link here. I hope you decide to join us there. The group is small for now and really, really sweet. 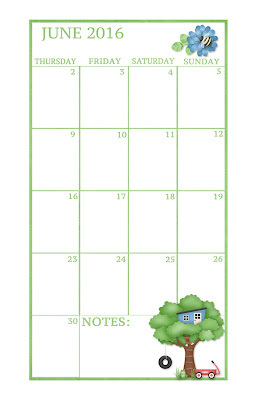 This is last weeks, free printable. Here is tomorrow's hybrid goodie. 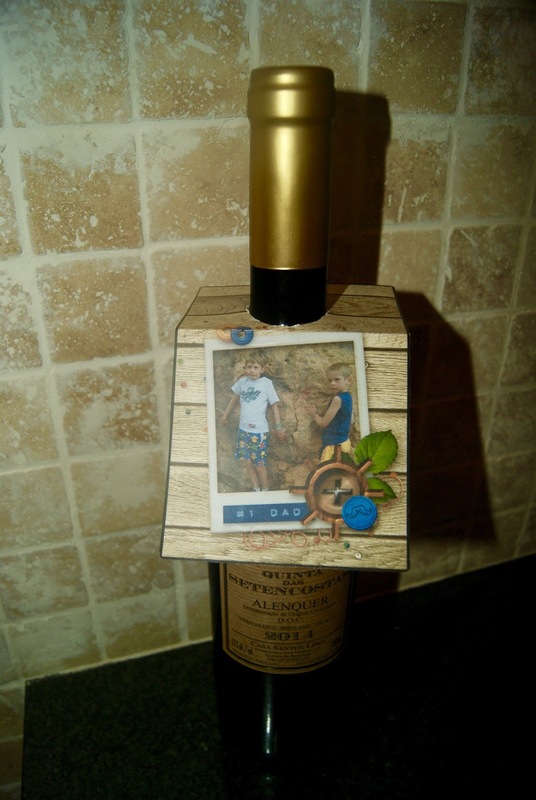 I'll have this bottle tag where you can place a photo and I'll also have a generic version where no photo is needed. See ya then! Join us on Facebook or Pinterest. Welcome to Throw Back Thursday at The Cherry On Top. 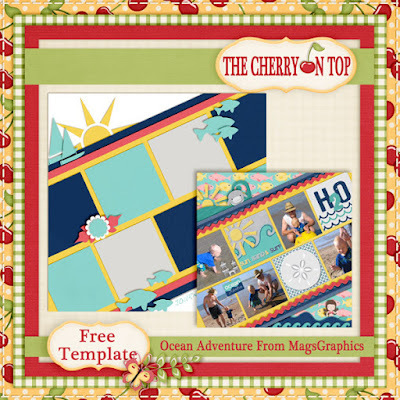 Check out this bright and bold kit, Ocean Adventure from MagsGraphics. 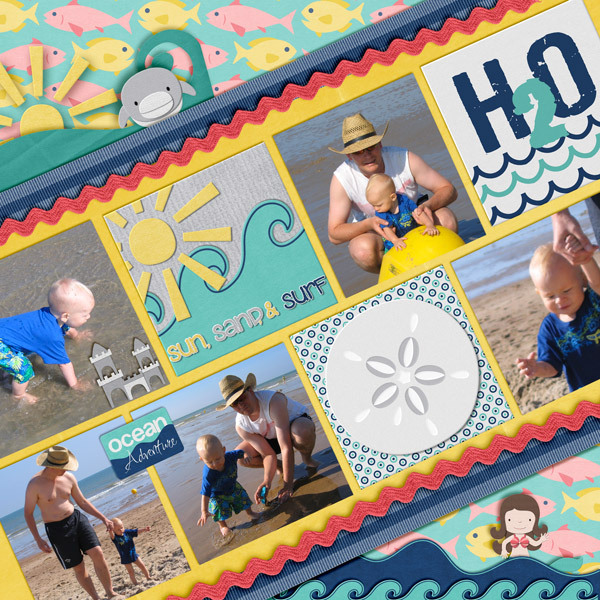 The vibrance and joy all captured in this kit for watery vacations or the beach. Here is the template. I did do a bit of scrap lift for this layout. I usually can't stand angles. "If it's not a right angle, it's wrong." Hehehe...I thought I'd challenge myself and though it was difficult, I'm pleased with the result. Those journal cards make scrapping a lot faster and easier. 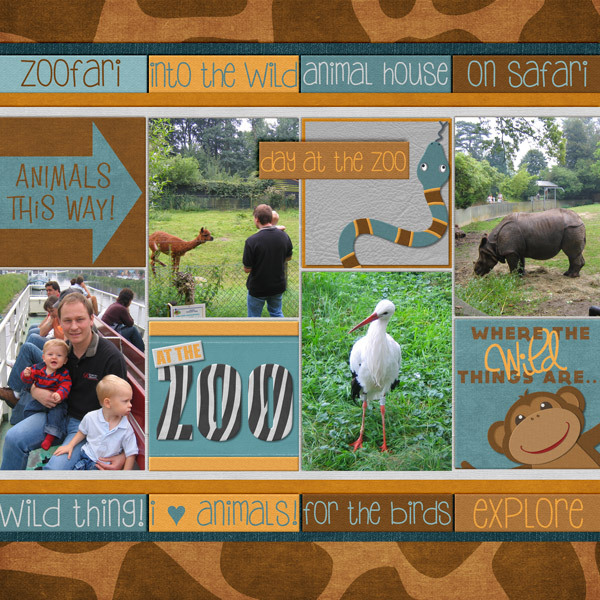 Another fabulous kit for just $1 is At The Zoo from MagsGraphics Design. 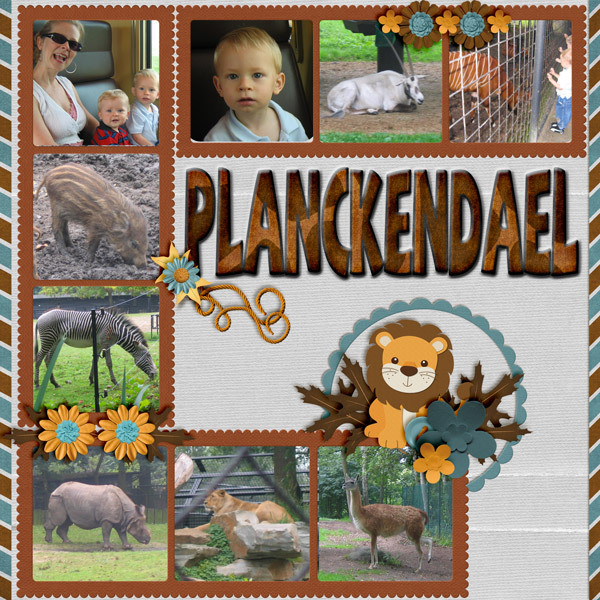 I scrapped up some older photos from our really fun trip to Planckendael in Belgium. We took the train, then the boat to get to the zoo. It was such a neat way to see things and to get there. As you can see, the kids loved it. Great colours and a great theme. Both my boys really, really love animals. These kinds of attractions are always a hit. A favorite kit of Mags is In The Garden. It too is just $1 for a week. 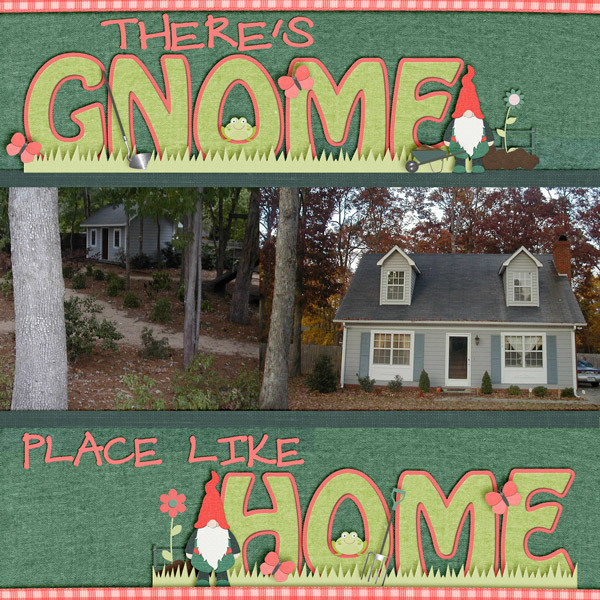 Take a look at my home in North Carolina that I scrapped up using these lovely gnomes. It's pretty much just some fancy word art/title with a big picture. I really love this one! 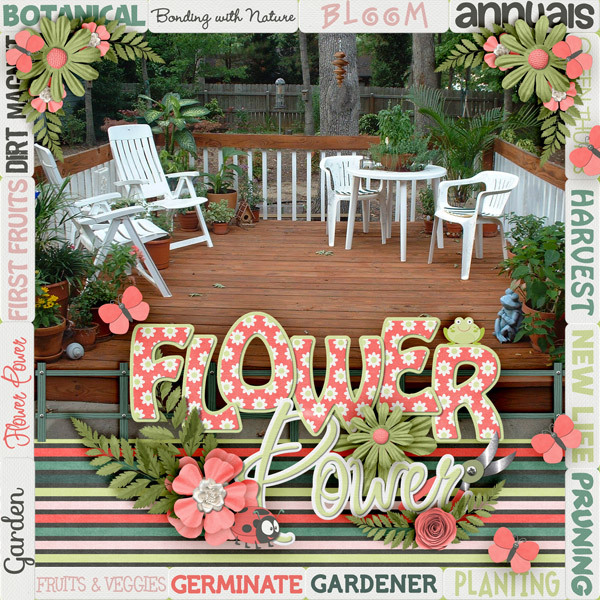 I worked like crazy to get the deck to look like this! Hehehe... I used the word strips to form a frame, added a duplicated corner cluster and fancied some already terrific word art in the kit. Here's the free template. Click on the preview to get to the blog for the direct download. Here is another little goodie you can grab. Right click on the image to save. That's it for today. Remember, all of our freebies are for personal use ONLY. We'll be back tomorrow for Freebie Friday and we've got a free Father's Day printable for Hybrid Saturday. See ya then!